The family of Daniel Covarrubias, an unarmed Native American man, claim race played a role in his 2015 fatal shooting by Lakewood police. The family settled a lawsuit this week against the city for $500,000. The City of Lakewood has agreed to pay $500,000 to settle a lawsuit filed by the family of an unarmed 37-year-old Native American man who was shot to death by police in 2015 after pointing a cellphone at officers. The settlement in the death of Daniel Covarrubias was finalized Wednesday in U.S. District Court in Tacoma and comes on the heels of a $13 million settlement by the city last year with the family of an unarmed African-American man who was killed by a Lakewood police SWAT sniper in 2013. Covarrubias was reportedly acting erratically and had climbed atop a large stack of lumber at the Pinnacle Lumber Yard in Lakewood, Pierce County, the afternoon of April 21, 2015. Employees called to report a trespasser and several Lakewood officers responded. Covarrubias was shot when officers said he held his cellphone in front of him in both hands and they thought it was a gun. The lawsuit alleged that “racial bias” likely played a role in the shooting. According to a claim filed with the city last year by Covarrubias’s mother, Marilyn, and a subsequent lawsuit filed in U.S. District Court, Covarrubias had just left a nearby hospital where he had gone to the emergency room suffering from hallucinations. Medical records indicated he believed he had cameras in his eyes and “would like them taken out;” however, he was released after doctors determined he did not pose an imminent threat to himself or others. The claim sought $15 million, significantly more than the eventual settlement. The family’s Seattle lawyer, Gabriel Galanda, said the settlement amount was reached after a mediation and recognizing the time and legal hurdles the family faced in pursuing a federal civil-right’s claim. The settlement, which will be paid by the city’s insurance provider, “does not diminish the loss of life or the lasting effects of Mr. Covarrubias’ death on his family and the police officers involved” but was intended to “provide closure and help everyone move forward with the healing process,” Grimley said in an emailed statement. 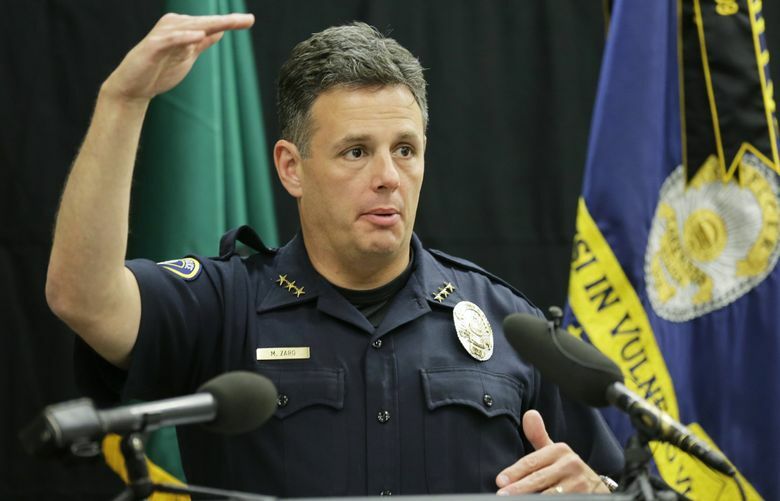 An email seeking comment from Lakewood Police Chief Mike Zaro did not receive a response. Employees at the lumber yard said Covarrubias was uncommunicative and acting “scared, startled, frightened and agitated.” One witness would later describe him as “mentally not there,” while another said he was “on another plane,” according to court documents. Employees called 911 out of fear that he might hurt himself, according to the lawsuit. Initially, three Lakewood officers responded, and one, identified in court documents as Ryan Hamilton, approached him with weapons drawn. After Covarrubias didn’t respond to verbal commands, Hamilton retrieved a rifle from his patrol cruiser and tried to target Covarrubias atop the woodpile, according to the lawsuit. That’s when, according to the complaint, a fourth officer identified as David Butts pulled up on his motorcycle, dismounted, drew his handgun and ran toward the lumber pile. “Within seconds of Butts’ arrival, defendants Hamilton and Butts opened fire on Daniel, killing him,” the lawsuit said. Covarrubias was struck four times in the head and torso. His cellphone was found atop the lumber pile. An autopsy showed he had methamphetamine and other drugs in his system. The Pierce County Prosecutor’s Office reviewed the shooting and determined it was justified, according to records. The City of Lakewood has been sued repeatedly over alleged civil-rights violations with racial overtones by police, and it was hit with a record $15.3 million federal jury verdict in July 2017 for the shooting death of 30-year-old Leonard Thomas, an unarmed African-American who was involved in a four-hour standoff with a SWAT team overseen by Zaro. The panel singled out the chief and two other officers for $6.5 million in punitive damages after finding they acted with “deliberate indifference” in taking Thomas’s life in front of his 4-year-old son. The city appealed but last year paid Thomas’s family $13.1 million, including $1 million from its own coffers. In 2014, a federal judge reinstated a civil-rights lawsuit against the city that had already been settled after a police-department document turned up indicating one of the officers involved in the incident had been singled out by a supervisor for racial profiling. That document was withheld from lawyers when the lawsuit was first filed, according to court records. The city paid a total of $87,000 for that claim.